Fox Sports is bringing plenty of technological firepower to its production of the inaugural Jr. NBA World Championship this week at ESPN Wide World of Sports in Orlando. In addition to outfitting coaches and parents with mics throughout the tournament in an effort to provide “all-access” coverage to viewers, Fox is using the Jr. Championship as a breeding ground for innovation by deploying a SkyCam point-to-point aerial camera system and a C360 360-degree camera system. Fox is lending a big-game mentality to its coverage of the inaugural Jr. NBA Championship. The inaugural event brings together the top 32 boys’ and girls’ teams (16 U.S. and 16 international) that advanced from regional competitions earlier this year, culminating with the World Championship games on Sunday. 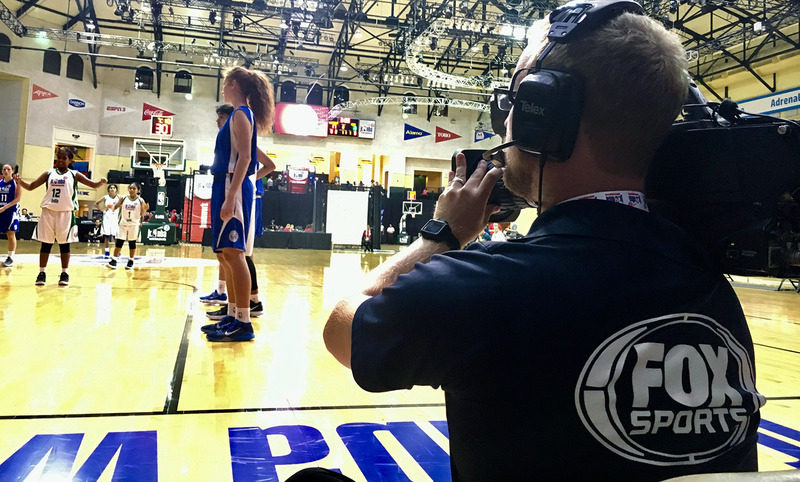 Fox and the NBA are building on the NBA and ESPN’s SkyCam and C360 experiments at Summer League last month in Las Vegas by deploying the systems for the fast-paced youth basketball tournament in Orlando. The C360 system is nothing new to Fox, which has deployed it for its MLB All-Star Game coverage the past two seasons. This week, it will mount the system in the above-the-rim location traditionally handled by a robotic camera. Round-robin pool play at the tournament on Tuesday and Wednesday (airing on FS1) is taking place on two separate courts at Wide World of Sports. Rather than rolling out a mobile unit, Fox is using two of the facility’s control rooms for early-round play. Starting with quarterfinals on Friday (on FS1), Fox will pool its resources from both courts into a nine-camera show (including SkyCam and C360 systems) using a WWoS control room for single-court coverage throughout the weekend on Fox. To provide that exposure and give viewers all-access, wireless mics will be installed on coaches and parents onsite in Orlando throughout the tournament. As in ESPN’s Little League World Series coverage and other youth sports events, the players’ families and supporting cast are expected to play a key role in Fox’s coverage. In addition, Fox’s roster of on-air talent for the tournament will include the debut of eight-time NBA All-Star Vince Carter; play-by-play announcers Gus Johnson, Mark Followill, and Brandon Gaudin; analysts Donny Marshall and Sarah Kustok; host Charissa Thompson (who will anchor an onsite pregame show on Sunday); and reporter Noah Eagle (son of sports announcer Ian Eagle).